In the world of fine arts, Cynthia’s line of fine art paintings offers the viewer unique contemporary fine art landscapes with the occasional venture into figurative and still life work. 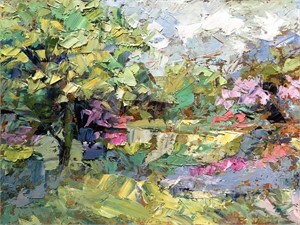 In the world of palette knife painting she is one of the best plein air landscape painters on the scene today. The focus of her work is in celebrating the outdoors in art. Her fascination with the glory of color and the concept of time combine to provide the viewer with original art of unique vision. As a plein air landscape painter, Cynthia gains inspiration from seeking out diverse landscapes, allowing for the varity of sites to provide both personal challenge and a richness of subjest to offer to her collections. No matter the scene, the style evident in her original work provides the common thread making her work immediately recognizable. In the world of fine arts, Cynthia’s line of fine art paintings offers the viewer unique contemporary fine art landscapes with the occasional venture into figurative and still life work. 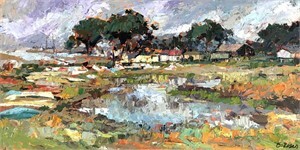 In the world of palette knife painting she is one of the best plein air landscape painters on the scene today. The focus of her work is in celebrating the outdoors in art. Her fascination with the glory of color and the concept of time combine to provide the viewer with original art of unique vision. As a plein air landscape painter, Cynthia gains inspiration from seeking out diverse landscapes, allowing for the varity of sites to provide both personal challenge and a richness of subjest to offer to her collections. No matter the scene, the style evident in her original work provides the common thread making her work immediately recognizable.